Hilton Hotels are now pet-friendly! 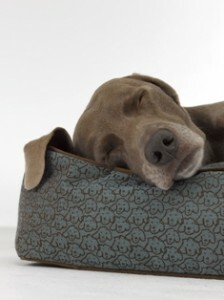 To celebrate this new inclusion of our furry friends, Hilton has partnered with artist William Wegman and Crypton Super Fabrics to create a line of upscale pet amenities to include: designer pet beds, food and water bowls, and an amenity kit with disinfectant deodorizer and upholstery brush. This is a great gift to help a pet feel at home when his owner has a case of separation anxiety.